Last week something special happened in my world. (Date: 3/1/17) My son, Thor (9), got up on stage at his talent show and solved a Rubik’s cube. But he didn’t just solve it. He did a large portion of it with his eyes closed. In front of an audience of over 350 people. Needless to say, it blew everybody’s collective mind that a little boy could solve a puzzle few in the (much older) audience could, and do it with his eyes closed. Looking back, I can honestly say that this was no accident. This was the result of my belief system on parenting and coaching – learning to learn, you could call it. 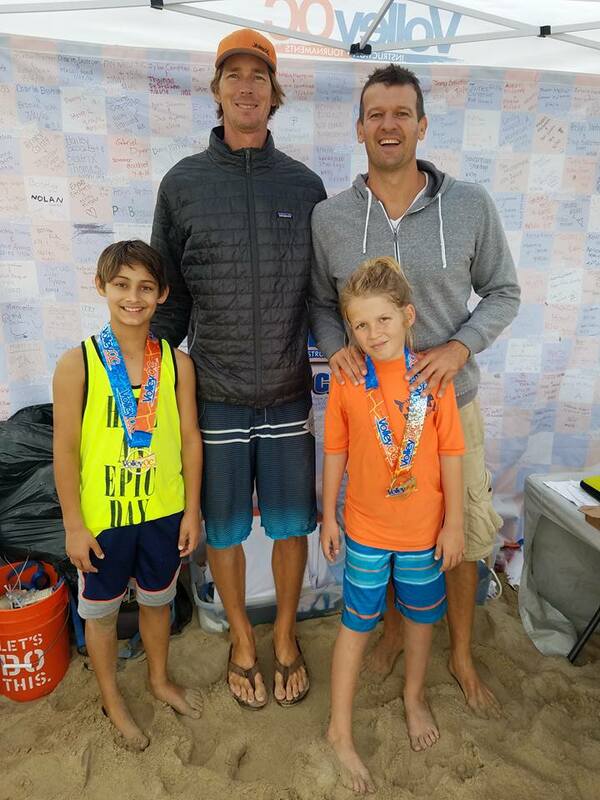 Andor Gyulai (Right) Coaching his son Thor 9 (Orange) to his first gold for beach. Be engaged / Find experts! Make mistakes – lots of them! It might seem whimsical, but those five steps are a proven system that has survived the test of time, helping generation after generation learn and improve and reach their dreams. With Thor and the Rubik’s cube, we began with the belief system. I told him about a 12-year-old girl I had met over the summer who could solve a Rubik’s Cube in less than two minute. He took it as a challenge. Our next step was to find experts online and on YouTube, and he began engaging with them in the learning process. Then came the fun part: Thor messed up. A lot. And he looked silly. A lot. I kept complimenting him for his efforts / struggle (Strategies from Nuture Shock) and it is in this phase that I swelled with pride when watching my son. He embraces looking silly. He embraced those mistakes. And he continued to practice and improve, mastering the cube at an alarming rate, particularly considering he was nine years old. A month later, he had mastered the cube. A few weeks after that, we were enjoying dinner at a Benihana, and my son – a blossoming entertainer, for sure – decided he’d do the cube for our table. With his eyes closed. When he opened his eyes, he had a perfectly completed Rubik’s Cube and a table of slack-jawed adults, all applauding. We live in a rapidly changing world, and we need to equip our kids and players with skills they will need both on the volleyball court and off of it. We cannot make progress if we do not yet know how to learn, and our players will need to constantly learn new skills and talents to adjust to the shifting job markets. Learn more about our Volleyball1on1 Summer Camps and how we teach important life lessons through sports. See why we are the best! The First Lesson You Should Teach Any Volleyball Player! Developing Self Confidence in Young Volleyball Players! Whole Person Growth – Peaking Players For Playoffs. It is never to early to teach these important life lessons! Thor Gyulai (My son) at 7 teaching Oragami on his YouTube page: Thoragami.